The Cork County Council National Roads Office was established in the late 1990s as part of a network of regional offices. Initially, it focused on the design of national roads in County Cork but has since evolved to encompass the design and management of national road schemes, in Cork City and County. 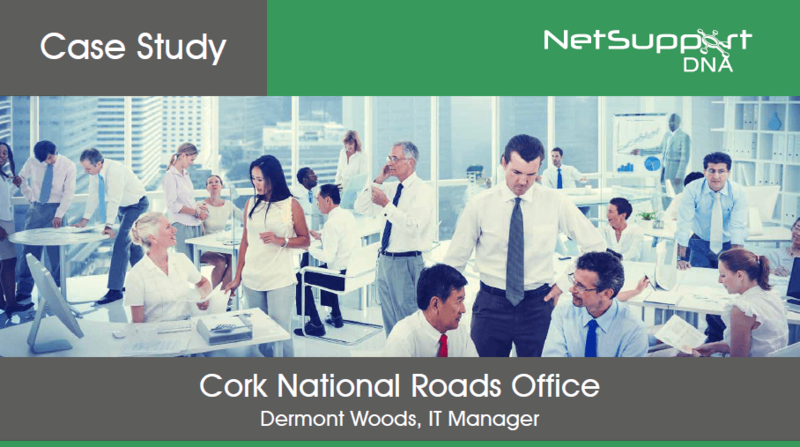 Cork County Council is the lead authority for the purpose of national road management. What were some of the main IT challenges you faced? Previously, we struggled with a lack of data about our assets. If we needed to know something about a particular machine, the only way to find out was to do it manually. Did NetSupport DNA help you to meet those needs? After we implemented NetSupport DNA, the situation was very different and, as it gathers so much data from each device automatically (storage, CPU, installed applications etc), we now have complete hardware and software inventories for all of our computers. It has helped us meet that need very well. How has NetSupport DNA contributed to your organisation? Due to there being many automated processes within NetSupport DNA, it has really saved the IT team a lot of time. From device discovery to application monitoring and enterprise reporting, it has really improved our performance – and the fact that it’s so easy to use is an extra bonus. I would definitely recommend that other organisations try NetSupport DNA. What do other staff in the organisation think of NetSupport DNA? Other members of the team are also impressed with how NetSupport DNA performs on a day-to-day basis, and how much data it gathers to help us with monitoring our IT asset register. From pre-sales to the Support Team, we’ve found working with NetSupport to be a very good experience. How do you see your NetSupport solution supporting your IT into the future? Much better than before. Once we start to implement more of the functions in DNA, we should be able to save the organisation more money, which is sure to go down well!